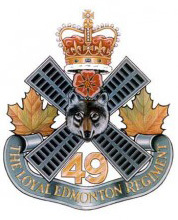 Between two maple leaves a windmill sail in saltire superimposed upon the centre of the sail a coyote’s head affronte surmounting the coyote’s head the red rose of Lancaster below the coyote’s head and resting on a scroll inscribed “THE LOYAL EDMONTON REGIMENT” the numerals “49” the whole surmounted by the Crown. Red Rose of Lancashire: Marks the unit’s alliance with The Queen’s Lancashire Regiment. Numeral “49”: Showing the unit’s perpetuation of the 49th Battalion Canadian Expeditionary Force. Grey and Green from the 49th Battalion’s World War One divisional and brigade patches, Black from the allied British regiment in memory of General Wolfe, and Red from The Loyal Edmonton Regiment’s World War Two divisional patch. Mount Sorrel; Somme, 1916; Flers-Courcelette; Ancre Heights; Arras 1917-18; Vimy, 1917; Hill 70; Ypres, 1917; Passchendaele; Amiens; Scarps, 1918; Hindenburg Line; Canal du Nord; Pursuit To Mons; France And Flanders, 1915-18. Landing In Sicily; Piazza Armerina; Leonforte; Agira; Adrano; Troina Valley; Sicily, 1943; Colle d’Anchise; The Gully; Ortona; Liri Valley; Hitler Line; Gothic Line; Monteciccardo; Monte Luro; Rimini Line; Pisciatello; San Fortunate; Savio Bridgehead; Naviglio Canal; Fosso Munio; Italy, 1943-1945; Apeldoorn; North-West Europe, 1945. The regiment originated on 1 April 1908, when the ‘101st Regiment’ was authorized. It was redesignated ‘101st Regiment (Edmonton Fusiliers) 1 March 1909 and ‘The Edmonton Regiment’ 15 March 1920. It was reorganized on 15 May 1924 to form two separate regiments designated ‘The Edmonton Fusiliers’ (later the 19th Alberta Dragoons) and ‘The Edmonton Regiment’. The latter was redesignated ‘The Loyal Edmonton Regiment’ 7 July 1943, ‘The Loyal Edmonton Regiment (3rd Battalion, Princess Patricia’s Canadian Light Infantry) 19 October 1954, and ‘The Loyal Edmonton Regiment (4th Battalion, Princess Patricia’s Canadian Light Infantry) 1 April 1970. Perpetuations: 49th, 51st and 63rd Canadian Infantry Battalions, CEF, 1914-1919. The regiment mobilized The Edmonton Regiment, CASF on 1 September 1939.’ This unit embarked for Britain on 22 December 1939. A detachment took part in the expedition to Spitsbergen in August 1941. The unit landed in Sicily on 10 July 1943, as part of the 2nd Infantry Brigade, 1st Canadian Infantry Division, and in Italy on 4 September 1943. It moved to North-West Europe in March 1945. The active unit was disbanded on 15 October 1945. A 2nd Battalion served in Reserve Army.” The 3rd Canadian Infantry Battalion (The Loyal Edmonton Regiment) mobilized on 1 June 1945 for service with the Canadian Army Pacific Force,” and was disbanded on 1 November 1945. On the Colour’s obverse side, as a central badge within the annulus, a silver windmill sail in saltire charged with a wolf’s head proper affront on a crimson field. Superimposed upon a windmill sail in saltire, a maple leaf; between the two upper sails the crown; between the two lower sails the Arabic numeral “49”; below the word “CANADA”. In brass. The letters “L EDMN R”, in brass. On garrison dress, a cloth shoulder-sleeve title with “49TH” over the words “THE LOYAL EDMONTON REGT” over “CANADA” in green on French grey edged black.